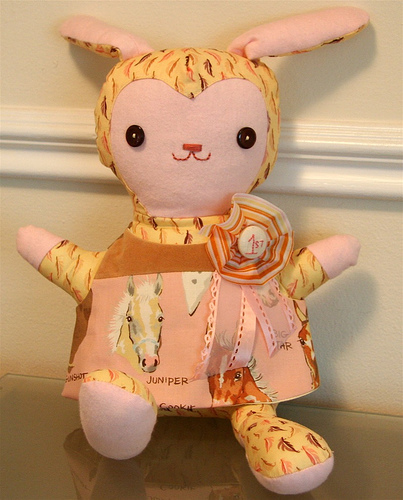 I just put the finishing touch, a first place ribbon, on the latest big footed bunny. She’s what they call a horse girl. Coincidentally, a fellow equestrian is talking shop today so fittingly this bunny shall be named Alicia Bunny. She’s lovely – and the 1st prize ribbon is a perfect final touch! Aren’t those horse girls soooo cute! Love it love it love it! *almost* as cute as her namesake! Oh my goodness!! I love her!! DO you do commissions? I would just love to have one made of a nurse! My darling Niece just graduated from college and passed her RN Boards, despite losing her father 7 months ago. I want to HONOR her with A Very Special keepsake. Absolutely adorable! I want to just hug her! how CRAZY was that coincidence! she’s perfection hillary!!! she’s so stinkin’ cute. i wish we got ribbons like that when i was in 4-H!! How adorable! I love the pink horse fabric! Is it Alexander Hamilton? The store I work at carried part of that line, so I picked up similar fabric (pink with cowgirls), but we never got the horsey fabric! I’ve recently started reading your blog regularly and I love your work, especially your toys and quilts. Your quilts have inspired me to try some designs of my own making! You can see some of my sewing, knitting, and cats at my LJ! ouch. she is way too sweet and I love her first place ribbon-you are the master of amazing details!! and cool patterened fabric for her body! She is soooo cute! That first place ribbon fits her perfectly. This Alicia bunny is just the cutest thing. Love that ribbon! She will make someone happy. Very sweet. That is really sweet. The ribbon is a nice touch.